Though Harmonix just announced its next project, CEO Alex Rigopulos wants to allay any fears about the future of the Rock Band franchise. This morning developer Harmonix revealed Fantasia: Music Evolved, a rhythm-based collaboration with Disney that serves as the studio's first big new franchise effort in years. Despite this (and likely regardless of how well Fantasia does), Harmonix is known best for their efforts in the Rock Band franchise. I'd explain what Rock Band is, but if you're on this website, I feel pretty safe in assuming that you're familiar with the title. 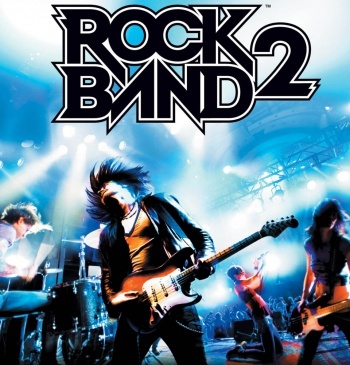 Having read Harmonix's announcement, many fans feared that the developer might be abandoning Rock Band. However, that's not the case. Speaking to VentureBeat, Harmonix CEO and co-founder Alex Rigopulos laid any doubts to rest as to how his company feels about their biggest success to date and its potential future. When asked how it feels to leave behind their earlier franchises in favor of this new project, Rigopulos explains that Harmonix doesn't see it that way. "On some level, of course, it's always difficult to leave one creative work behind and move on to the next one," Rigopulos states. "On another level, it's exciting to be doing fundamentally new things." "I'll also say that we don't view Rock Band as something that's being left behind. It's something we'll return to at the right point in time and reimagine it as appropriate for its time," he adds. When or how this next step in the evolution of Rock Band might emerge remains a mystery, but the idea of a next-generation Rock Band is undeniably exciting for those of us who fall squarely in the middle of the Venn diagram labeled "music nerds" and "videogame nerds." That said, there are many issues surrounding the idea. If nothing else, Harmonix will need to figure out some way to transfer the hundreds of songs many of us have stored on our current consoles specifically for Rock Band without incurring a ton of licensing fees or charging players too much additional cash just to enjoy the music they've already purchased. Further, would a next generation Rock Band require that we repurchase all of those plastic instruments we spent good cash on only a few years back? Hopefully Harmonix has a plan to combat these issues, but if not the firm does have a substantial amount of time before it has to start worrying about its next game. In the meanwhile, let's keep our fingers crossed that Fantasia: Music Evolved is another entry in Harmonix's portfolio of wildly addictive rhythm titles.